If Missouri voters approve the constitutional amendment on Nov. 8, then a statute approved earlier this year over Gov. Jay Nixon’s veto would go into effect in 2017. That statute would implement the photo ID mandate. It stipulates that the state would pay for supporting documents, such as a birth certification, that would be needed to procure government-issued identification. That’s expected to cost the state roughly $17 million over three years, a price tag that’s been derided by photo ID opponents. The law stipulates that if the state doesn't cover such costs, the photo-ID mandate cannot be enforced. The implementation measure would also allow people without photo IDs to cast regular ballots if they sign a legally binding affidavit promising they are who they say they are. That provision has softened some Democratic criticisms. So why do most Republicans want a photo ID requirement? Many in the party believe that it will make it harder for people to commit voter fraud. Some supporters like GOP state Rep. Shamed Dogan point to the requirement that people show a photo ID before being allowed to fly on commercial airplanes. “It’s common sense that you should be able to prove who you are to vote. You don’t want somebody to cast a vote in your place,” said Dogan, R-Ballwin. “You don’t want someone showing up to the polls on behalf of someone else or someone who doesn’t exist necessarily. So what type of voter fraud is Dogan talking about? 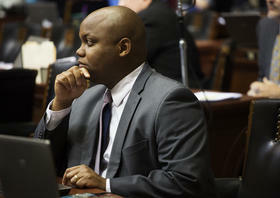 State Rep. Justin Alferman, R-Hermann, points to recent incidents where people fraudulently registered to vote, gathered initiative petition signatures or cast absentee ballots. However, the proposed photo ID mandate would not apply to absentee ballots — which were the cause of the problems that prompted judges to order new elections. In any case, Democratic opponents of the photo-ID measure say it's all about politics. Robin Smith is the Democratic nominee for secretary of state. She has made fighting the photo ID amendment one of her top campaign planks. She and other Democrats strongly feel the photo ID mandate is a solution in search of a problem. And she says it makes it harder for thousands of people to vote. Democrats note that many of those targeted groups — especially minorities, students and the poor — tend to vote Democratic. Others point to national studies showing that cases of in-person impersonation fraud at the polls are extremely rare. "There is no purpose for us to be changing the rules to require a state-issued photo ID in order to vote," said state Rep. Stacey Newman, D-Richmond Heights. "No one has come up with why we need to do this." There’s some evidence that Smith and other Democrats aren’t going to let photo ID pass in Missouri without a fight. Democratic officials are also making opposition to photo ID part of their rhetorical pitches. Many of the Democratic candidates' campaign fliers sent around the state feature references to their opposition to Amendment 6. In early October, just hours before the presidential debate at Washington University, some prominent area Democrats were sounding off against photo ID at an event held near the Missouri History Museum. In front of a big blue Democratic National Committee bus, U.S. Rep. Lacy Clay said there was a moral obligation to oppose the proposal. He brought up three civil rights workers who were murdered in 1964 while registering black voters in Mississippi. Still, the outcome of Amendment 6 may hinge on party turnout. If more Republicans go to the polls to vote for the GOP ticket, then it stands to reason they’ll also vote for Amendment 6. If Democratic turnout spikes high enough, that could lessen the amendment’s chances.